Undefeated leader Petrochimi delivered the twelfth consecutive win on Thursday night. This time they crushed bottom-ranked Raad (0-12) 92-47 in Bandar Imam. Undefeated Petrochimi (12-0) have an impressive series of eleven victories in a row. They maintain first place with a perfect record of 12 victories in a row. Newly promoted Raad still closes the standings with 12 games lost. The game in Esfahan was also worth to mention about. Second ranked Chemidor (11-1) played at the court of 5th ranked Zob Ahan (5-6). Chemidor managed to secure a 6-point victory 54-48. The victory was the eleventh consecutive win for Chemidor. Newly promoted Chemidor maintains second place with 11-1 record behind leader Petrochimi. Zob Ahan at the other side, also newcomer in the league, keeps the fifth position with six games lost. In the last two games of round 13 Army was defeated by Naft Abadan in a road game 81-64. Gorgan beat Pegah Tehran at home 77-66. There was no surprise when 6th ranked Army (4-8) was defeated on the road by third ranked Naft Abadan (9-2) 81-64. The victory was the fourth consecutive win for Naft Abadan. They maintain third place with 9-2 record having four points less than leader Petrochimi. Army lost their fourth game in a row. They keep the sixth position with eight games lost. Undefeated leader Petrochimi delivered the twelfth consecutive win on Thursday night. This time they crushed bottom-ranked Raad (0-12) 92-47 in Bandar Imam. Petrochimi (12-0) have an impressive series of eleven victories in a row. They maintain first place with a perfect record of 12 victories in a row. Newly promoted Raad still closes the standings with 12 games lost. No shocking result in a game when fourth ranked Shahrdari Gorgan (7-4) defeated at home 8th ranked Pegah Tehran (2-10) 77-66. 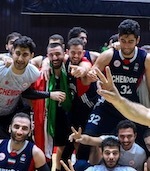 The victory was the third consecutive win for Shahrdari Gorgan. They maintain fourth place with 7-4 record. Pegah Tehran lost their third game in a row. Newly promoted team keeps the eighth position with ten games lost.